At Golf Locker we offer only the finest brands in golf apparel for your embroidered custom logo needs. We pride ourselves on partnering with only the best brands with the highest quality golf polos and apparel and bring them to you for your customization needs. 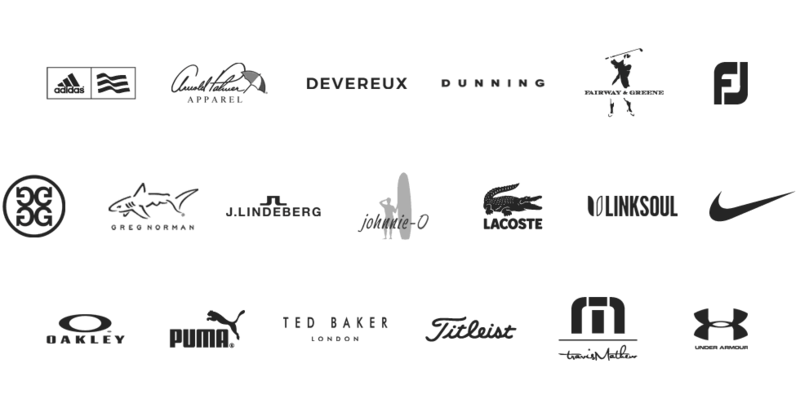 These are the brands that you'll see the world's best golfers wearing on a Sunday at a major. This is the custom embroidered golf apparel that you'll feel proud to hand out to your best customers and reward your employees. These are the brands that you'll take pride in wearing to show off your company or organization logo. Choose from polo shirts, pullovers, hats, bags, windbreakers and more. We have state-of-the-art embroidery machines right here at our Golf Locker headquarters in sunny Tampa, FL. Our trained staff of professional sewers will embroider your chosen golf polos or golf apparel with your logo. You can order any piece of customizable golf apparel directly from our website. You can order as little as one piece or thousands at a time. After your order is placed, we will begin preparing your logo for embroidery. You can order one golf shirt along with one pullover and perhaps a hat for your complete order. You can order the same golf shirt style in five different colors if you'd like. Once your logo is complete and in our system, the possibilities are endless. We've always taken pride in our customer service throughout the years that we've been serving golfers worldwide since 1995, and our custom logo golf apparel department follows in that tradition. We promise to perfect your logo for embroidery, keep you informed during the customization process, deliver on time and follow up with you to make sure everything went flawlessly with your order. We understand how important your logo is to you, and we will make sure you are overly satisfied with our service to you. Let our team of embroidery specialists take your logo and optimize it for embroidery on your chosen golf apparel. If your logo hasn't been used on our website before, you can upload your logo file on an item page while ordering here on our website, choose a previously used logo from your account while ordering on our website or email us your logo information after you place your order. You can email us your logo in any type of image file - jpg, gif, eps or whatever. Please email your logo artwork to us (custom@golflocker.com) or simply send us a link to your website. We'll do the rest. We will begin the logo preparation after you place your order. After we receive your logo, we will optimize it for embroidery. We will then email you an image of a sew-out sample for your approval. All of this is done at no cost to you and takes 1-2 business days depending on your response time. Once you approve your sewn-out logo, we will begin the embroidery process on the items that you have ordered. Embroidery is completed in 3-5 business days, and your order will ship. For orders with in-stock items with a new logo, the turnaround time for your order to ship is 4-7 business days depending on how fast you review and approve your logo sew out. Orders for items are that not in stock and have to be ordered from the manufacturer will take an extra 7-10 business days to ship. Logo digitizing and preparation for embroidery is always free, and you can order as few as one piece with your logo. Quantity discounts on items are available. These charges are added on to the price of the item being purchased as indicated on our website after your order is placed. For logos over 10,000 stitches, which is very rare, there is a $1 charge for every 1,000 stitches over 10,000 stitches for each item. So if your logo is 13,000 stitches, there would be an extra $3 embroidery fee per item. Once your logo is prepared and approved by you, we will upload it into your account for easy future ordering purposes on our website. You can order many different styles to reach the price break levels for embroidery. You don't have to order the same exact item. Go for it! SIMPLY SEND US YOUR LOGO, WE'LL DO THE REST!